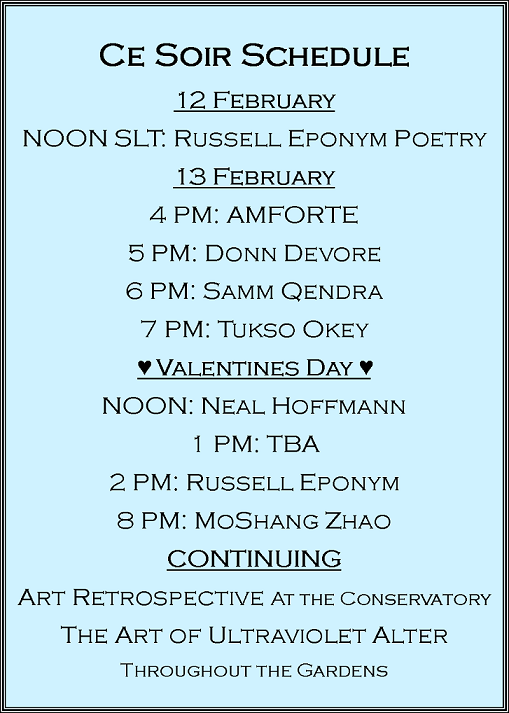 The day of LOVE approaches… – Ce Soir Arts – Be inspired tonight! Valentines Day (or is that Valentine’s Day?) is a very special day that most people set aside to pay special attention to the people in their lives – especially those extra-special partners, spouses, and loved ones. It’s a sweet day and one we all seem to enjoy. Even when we are on our own, Valentines Day reminds us that love is important – especially loving ourselves and those closest to us. KINDNESS is the order of the day. Do something wonderful for yourself! Take a spa day, start that book you’ve been wanting to read, listen to your favourite music, even as you make your way to work. Enjoy the day with colleagues and friends. Send a funny little valentine to someone you like a lot and have maybe not told how you feel. End your emails with a “Happy Valentines Day” and perhaps a little heart icon or something. Bring treats to work and share… Well, you get the idea! And go further, if you wish: donate some funds to a charity you support – or find a new one and give them a nice little surprise; you’ll help people and feel better for it. And if you’re low on funds – just remember to smile. THAT can make all the difference in the world! Here is the schedule for the week. Come…be inspired tonight!